Ravindra Jadeja produced a masterclass in spin bowling with figures of 7/48 as England were bowled out for 207 on the fifth day of the final Test in Chennai. India sprinted over the finish line to win by an innings and 75 runs with 8 overs remaining for the day and completed a 4-0 series win. England began the day knowing that a win was highly unlikely in the match and the best-case scenario was to grind out a draw by batting through the day. As expected, India handed R Ashwin the ball to bowl the first over of the day. However, Virat Kohli surprised everyone by opting for the pace of Ishant Sharma from the other end. Alastair Cook's struggles against Ashwin continued with the English captain getting a nick on the off-spinner's delivery. But lady luck was smiling down on the Englishman as Parthiv Patel tried to catch the ball that was heading into Kohli's hands and ended up giving Cook another lifeline. The England openers, then, started a blockathon scoring just 35 runs in the first twenty overs of their innings. However, once they got used to the pace of the track, they started putting the bad balls away and brought up their fifty in the next four overs. The trend continued throughout the first session of play as England were tentative in their shot selection and with the ball still relatively new, a breakthrough looked like a distant dream. England ended the first session at 97/0, with both their batsmen well-settled in their forties. After lunch, however, England looked vulnerable for the first time in the second innings. Cook survived a review for LBW, off a Jadeja delivery, on the third ball after lunch. He wasn't so lucky in the next Jadeja over when he tried to sweep a ball well outside leg stump. The ball took a wicked edge, and KL Rahul was in no mood to give Cook another chance. Jennings was the next to fall under Jadeja's challenge as he hit a weak shot right into the all-rounder's hands. Jadeja looked like a man possessed - he struck again when he trapped Joe Root plumb in front of his leg stump. England looked to be in trouble at 126/3 when Jonny Bairstow walked in to join Moeen Ali at the crease. It only got deeper when with three runs added to the score, he skied an Ishant Sharma delivery and Jadeja was at hand to take a stunning catch off a ball dropping over his shoulders. Stokes, who joined Ali at the crease, made sure that England went to the last session of the day just four wickets down with the score at 167. Stokes and Ali continued their partnership after tea and looked on course to taking England to safety. However, Jadeja continued his demolition job by dismissing Stokes and Ali in quick succession. Ali threw his wicket away with an ungainly slog to give Ashwin a comfortable catch at the mid-on, and a couple of overs later, it was Stokes who walked back to the pavilion. The Englishman closed the face of his bat while trying to nudge it for a single, but he only managed to hit it straight to Nair at midwicket and give Jadeja his fifth wicket of the innings. Liam Dawson, who remained unbeaten on 66 in the first innings on his debut, did not last long either as Amit Mishra finally joined the party. The leggie foxed Dawson with a googly, much like he did to Ball in the first innings, and dislodged his stumps. From 192/4, England were all of a sudden down to 196/7 and staring down the barrel. Adil Rashid too did not last long with Umesh Yadav picking up his first wicket of the innings. 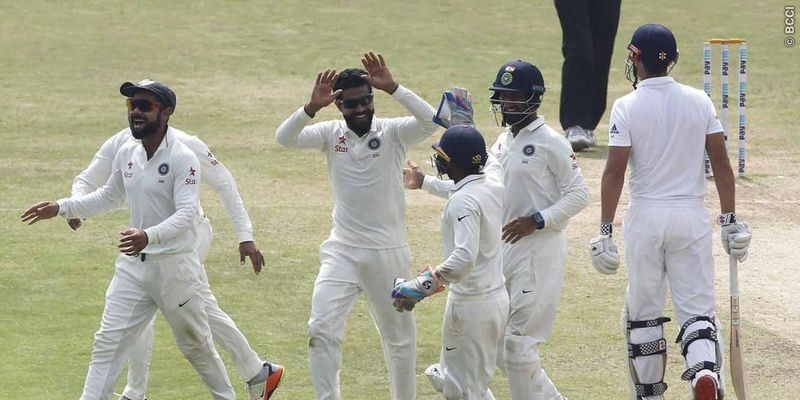 The English spinner produced a leading edge while trying to flick the ball to the leg side and gave a simple catch to the man of the hour - Jadeja. Stuart Broad joined Buttler at the crease and for a while it seemed like India would run out of overs to bowl England out. Inevitably, questions would have been raised about Virat Kohli's late declaration. However, thankfully for Kohli and India, Jadeja made sure that did not happen. The left-arm spinner dismissed Broad and Jake Ball in the space of three deliveries in the 88th over and sealed a thrilling win for India.